Paintings, photos and installations by five women artists from India, the UK and the US, showcasing contemporary themes, explored through a range of media, displaying striking innovation and originality. The exhibition at the National Museum showcases the work of jeweller Carl Fabergé (1846-1920). The pieces on display have been brought to New Delhi from London, St Petersburg and Moscow, and are valued at about $22 million in all. Don’t miss the many jewelled Easter eggs that Fabergé is famous for. 10am-5pm, Tuesday-Sunday. National Museum, Janpath (23019776). Indian citizens, Rs10, students, Re1, others Rs300. Papa CJ describes himself as India’s comedy export. 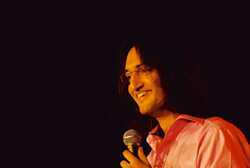 The international stand-up comedian performs in the city for the first time. 8pm. Kamani Auditorium, Copernicus Marg. Call 9873244724 for information. For tickets, email bookings@papacj.com with your requirements and mobile number. Stalls, Rs750, balcony, Rs500. with street plays, puppet shows, concerts and more. Activities will continue until February. 1.30pm onwards. Constitution Club lawns, Rafi Marg (23711276). A recital by Sugata Marjit, current director and the Reserve Bank of India professor of industrial economics at the Centre for Studies in Social Sciences, Kolkata. He presents a Hindustani vocal recital this week in the city. 7pm. Habitat World, India Habitat Centre, Lodhi Road (24682222). Feisal Alkazi’s final production this year is a Hindi remake of Patricia Highsmith’s ‘The Talented Mr Ripley’, where cunning conman Sylvester Fernandes befriends Ricky, with his ultimate plan culminating in a brutal murder. 7.30pm. Epicentre, Gurgaon. Tickets at Rs200-500, available at the venue . Building Blocks conducts a well-researched programme that introduces children to the concepts of energy science. Participants create three different kinds of products that use mechanical, wind and sound energy. They also explore the concept of energy conversion and renewable energy. An “inventor’s pack" and toolkit to create science products will be on offer at a discounted price. Age 12-17. 9-12am & 2-5pm. There are workshops in Gurgaon (call Naresh Sharma at 95124-4384384) and Kirti Nagar (call Vikash at 9818058515). Fees, Rs2,100 or Rs2,500 inclusive of toolkit. Menaka, a feminist interpretation of the mythological legend in Bharatanatyam, was conceived and written by Vasanth Kannabiran, a women’s and human rights activist. The 70-minute ballet, choreographed and performed by Rajeswari Sainath (with troupe), uses English lyrics interspersed with Sanskrit slokas, classical Carnatic music and Bharatanatyam. In Surendran Nair’s fabulous imagination, men levitate wearing colourful masks, wings unfurl from women’s bottoms, noses turn into trumpets, hearts sprout blood red hibiscus flowers and the body reveals itself to be a machine or an elaborate constellation of symbols. Curated by Rekha Rodwittiya, ‘Pernoctations and Early Drawings’ is made up of a set of surreal paintings and a collection of drawings by Surendran Nair. Although the paintings are recognizably fantastical, the real treasure in this exhibition is the set of drawings, done mostly when Nair was a student. The word pernoctation means the act of doing something all night and it is Nair’s polysyllabic way of referring to the dream-like imagery of his paintings. Sakshi Gallery, Tanna House, 11A, Nathalal Parekh Marg, near Regal Cinema, Colaba (66103424). The Mohile Parikh Centre for the Visual Arts brings you a chance to see short films on some of contemporary art’s most celebrated names. ‘Georgia O’Keefe—A Life in Art’ (15 mins) is a portrait of the artist using her own words, letters and archival footage. Hear from Lebanese performance and video artist Mona Hatoum about how she crafts her works. Anish Kapoor, India’s most famous artistic export in recent times, discusses his unusual sculptures while following the making of the piece titled ‘Marsyas’. 6.30pm. Little Theatre, National Centre for the Performing Arts, near Hilton Towers, Nariman Point (66223737). Shubradeep Chakraborty reveals that police forces across the country, especially in Gujarat, are systematically torturing and killing innocent Muslims in the name of countering terrorism. The documentary looks at the cases of Samir Khan Pathan, Ishrat Jahan, Javed Sheikh, Sadiq Jamal Mehtar and Sohrabuddin Sheikh, who were accused of attempting to assassinate Gujarat chief minister Narendra Modi. 7pm & 9pm. Prithvi House (opposite Prithvi Theatre), First Floor, Janki Kutir, Juhu Church Road, Juhu (26149546). Hindustani classical solo recitals by ‘khayal’ vocalist Modak, tabla player Shirodkar and ‘thumri’ singer Pathak close the Sharda Utsav, the annual festival organized by the Sharda Sangeet Vidyalaya. 5.30pm. Vishnu Digambar Paluskar Sabhagriha Nadbrahma Mandir, near Kala Nagar, Madhusudan Kalelkar Marg, Bandra (E) (26590433). in Maharashtra. Chaitanya Tamhane’s ‘Grey Elephants in Denmark’, named after a popular mind-reading trick, traces Iyengar’s evolution from a mediocre magician into an internationally acclaimed performer of cutting-edge tricks and psychological illusions. His main competitor is an unassuming Gujarati woman from Ghatkopar, who has a peculiar forte for deception. Tamhane, who is only 21, has written and directed the play. 6pm & 9pm. Prithvi Theatre, First Floor, Janki Kutir, Juhu Church Road, Juhu (26149546). For tickets, call 26149546. It’s called ‘Every Sunday Art’ by the Bimba Art Foundation. It’s the performances that you need to get here for, and then hang around to experience what Bimba’s founders and the artist Deepika Dorai call the “holistic artistic lifestyle". Getting there may be difficult, so this may help: From South End Circle, follow South End Road to Nagasandra Circle and take a right at the circle to enter DVG Road. 42, Ratna Vilas is at a corner, about 120m from here, behind the Netkallappa house. Look for the 100-year-old building opposite Canara Bank, adjacent to KR Shamanna Park. Drop by for some still theatre “in miniature art form" by Uma Nagraj and Deepika Dorai. Recitals are on at 5pm and 6.30pm, every Sunday. 42, Ratna Vilas Road, Basavanagudi (41489354). A group show by Kusal Gunasekara from Sri Lanka and Urmila V.G., as part of the South Asian collaborative project. The show is on at 1, Shanthi Road, home of Suresh Jayaram, former dean of Chitrakala Parishath. Since 2003, when he opened up his new home for artists in residence, Jayaram’s had about 20 artists living and working out of here. Today, it’s a place where artists gather to bounce ideas off each other, seek critiques, and work in seclusion if they need to. There are even requests from dance troupes looking to rehearse in 1, Shanthi Road’s gallery hall. “I just tell them what they have to work with, and who knows what will happen," said Jayaram. Eric Weiner, a writer who spent a few days here called it “a sort of revolving salon" in his book ‘The Geography of Bliss’. “Everyone passes through One Shanti Road." At any point, there can be up to three artists in here, and very often, the house is bustling with people—for exhibitions, screenings, performances and impromptu parties. Rarely ever are these people charged. 10am-7.30pm. 1, Shanthi Road, Shanthi Nagar (9880227706). Directed by Baharul Islam. Writer: Rabindranath Tagore. Cast: Bhagirathi, Baharul Islam, Shinee Goswami, Chandan Deka, Arundhati Kalita, Enu Boruah, Meghali, Mousumi, Jabamoni. This short story by Tagore is a piercing psychological inquiry into the changes that overtake a loving couple when Harasundari, the long childless wife, implores her devoted husband Nivaran to take a younger wife who will bear him a child. After much hesitation he agrees and takes a younger bride, Sailobala. But when he begins to be besotted with her, rediscovering passion anew, Harasundari’s torment becomes crushingly real. Faced with excluding doors in her own home, her plan of redemption for her husband only serves to deepen her own sense of abandonment and damnation. This production by Seagull Theatre, Assam, was first premiered in Kolkata in September as part of the Third Ravindra Utsav, a festival intended to encourage non-Bengali explorations of Tagore’s work. Seagull’s version incorporates the traditional Assamese folk form Dhulia, a physical and comedic narrative form not unlike the Commedia dell’Arte. 7.30pm. Ranga Shankara, 36/2, 8th Cross, 2nd Phase, JP Nagar (26592777). Tickets, Rs100. The country’s first and only professional female ‘ghatam’ player loves to narrate the story of how she convinced percussion icon T.H. “Vikku" Vinayakram that she could in fact play the ghatam— the modified clay pot instrument that shot to stardom when Vikku performed with fusion pioneers Shakti. Women percussionists were unheard of in the 1970s and, as legend now has it, “even Vikkuji was hesitant in the beginning to accept me as a student", says Ramgopal. In the 1970s, Vinayakram and a few of his students began a tradition he called Ghata Mala, which consisted of a small group performing on ‘ghatams’ tuned to different pitches. Ramgopal decided that being able to handle six ‘ghatams’ at varying pitches single- handedly would give her access to performing several ‘ragas’. That was the inspiration that led to the conceptualizing of Ghata Tharanga, where ‘ghatams’ create melodies, rather than percussion. 6pm. HN Kalakshetra, National College, 36th Cross, 7th Block, Jayanagar (26549684). Nigeria-based photographer Samuel Fosso is famous for taking pictures of himself. Self-portraits are the only pictures he takes and he’s been doing this for over 30 years. The exhibition ‘Autoportraits’ offers a comprehensive look at his work between 1976 and 2003. 11am-7pm. Photoink, MGF Hyundai Building, 1, Faiz Road, Jhandewalan (28755940). Dinesh and Varsha Thacker exhibit their private collection of paintings and prints of the Indian subcontinent in the 18th, 19th and early 20th century. Thomas and William Daniell, Emily Eden and William Simpson will be some of the many artists on display. 10am-7pm. Coomaraswamy Hall, Chhatrapati Shivaji Maharaj Vastu Sangrahalaya, MG Road, Colaba (22844484). Sampradaya Dance Creations presents two pieces, one titled ‘Vivarta’ which is based on the incarnations of Vishnu and the second, ‘Howzaat!’ which is a contemporary work that explores cricket through the subtext of colonialism, politics and pop culture. “I am bringing (to Bangalore) a traditional piece (’Vivarta’) as well as a piece that is considered contemporary (’Howzaat!’) because I want to shatter the illusion that formality and precision in classical dance is seen as lacking in dancers of the diaspora," said Lata Pada, choreographer and producer based in Canada. Three people birthed the dance piece ‘Howzaat!’—Rahul Srinivasan, who said he “suddenly" fell in love with cricket, Pada, who grew up obsessing over the game and Ramachandra Guha, cricket historian who lent her the book ‘Beyond the Boundary’ by C.L.R. James. “Rahul (Srinivasan), my nephew, born and raised in Canada, was a brilliant ice-hockey player and was suddenly fascinated with cricket and wanted to play because it made him feel Indian," said Pada, who has choreographed the piece. “This happened after Rahul watched a match with a friend who had moved to Canada from India. That, according to her, was one of the reasons why cricket became the basis for the performance—she found it interesting that the game represented “national pride and identity". However, it was a line Pada read in ‘Beyond the Boundary’ that, according to her, brought the piece to life. “In the book, James says, ‘Cricket is first and foremost a dramatic spectacle. It belongs with the theatre, ballet, opera and the dance’," she explained. “Being a choreographer, I always look for movement, because that is how the human body becomes an instrument of expression. And in cricket there is an elegance and grace of movement." We’re not entirely sure about what Lensbaby lenses really do. The firm’s three-lens range—the “Muse, “Composer" and “Control Freak"—is devoted to finding that sweet spot of sharp focus surrounded by graduated blur. The Joby Gorillapod (right), on the other hand, is the kind of reason people take to photography. It twists, bends and can be wrapped and fastened around branches of trees, or lamp posts. We’re not sure if they train these creatures to knock soccer balls around. Visit ‘www.lensbaby.com’ and ‘www.joby.com’ for prices and international shipping information. The primary aim of ‘iaido’, or samurai sword fighting as it is commonly known all over the world, is to enable you to thwart any attack using presence of mind and quick reflexes. To start with, you will be handed a ‘bokken’ or a wooden sword. Only after you have mastered the basic moves will you progress to handling a real sword. Mehul Vora’s classes in Mumbai help to develop lower body coordination and balance. Mehul Vora conducts classes at MP Shah School, Sarojini Road, Vile Parle (W), Mumbai; (26256201/9820055730). You will love these sneakers with aliens, red apples, and Mario Miranda-style cartoon characters painted on them. One pair even has railway destination boards painted on and “tez local" inscribed on one side. There are many more designs at the Attic in Mumbai. Amrita Deliwala, a partner at the Attic, says that she sources them from two women who run craft and design companies out of their homes: Mind 2 Sole and Lotus White. At Rs2,000 each, though, we wouldn’t suggest you risk having them stamped on while trying to board a tez local. 10.30am-8.30pm, daily. Attic Bir Sagar, Flat No. 1, end of 17th Road, Santa Cruz (W), Mumbai, (32169292). The mystery surrounding a locked green gate in Bangalore’s Lalbagh, leading to the Lake Island, can be dispelled by G.K. Vasantha Kumar, Karnataka’s director of horticulture. The island, which measures 2.7 acres, including a 175-foot pathway connecting it to the shore, dates back to 1881 and was later enlarged and fortified. Planners hoped it would become a serene haven for birds and induce a spirit of tranquillity among visitors. No such luck though. Officials are now warming to the idea of opening it to “select" orchid fans and birdwatchers.